This is an experimental dish we tried at home….and truly speaking it came out well. It’s not a full curry item, a dry recipe I must mention, but a tasty one…try once, am sure you will like it. 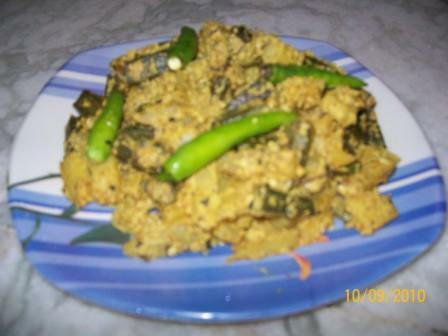 Cut bhindi and potato slightly thicker than finger chips. Take oil in a pan, when its get heated add black jeera. Now add the cut vegetables and fry for some time. Then add the poppy seed and mustard paste along with slitted green chili. Add salt and turmeric powder and fry for some time. Now add water and boil for few moments, till the vegetables become soft. Allow the excess water to dry up. Now your dish is ready to be served. I’ve never added water to an okra dish so this is something new. Shall give it a shot and see how it turns out. Thanks Anchal for reading my post and commenting.